The tale of an extraordinary, maverick woman and her even more remarkable achievement. May Savidge lived in a half-timbered house in Hertfordshire. When the council served her with a compulsory purchase notice to make way for a roundabout, May decided she had to move – but so did the house. So she had the whole thing dismantled and shipped to the North Norfolk coast… and then spent the rest of her life rebuilding it, single-handed. Her fame spread around the world. Antiques Roadshow broadcast, unprecedentedly, two features about her house. Written with May’s neice, Christine Adams, who inherited May’s house and completed it – at the cost of her own marriage – who tells her aunt’s life story from the voluminous diaries and letters she left behind. 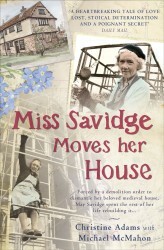 Christine Adams now runs a Bed and Breakfast in May Savidge’s old house in Norfolk.